Individual solar-panel systems produce dc power for remote applications while also storing energy in a rechargeable battery supported by a battery-charger IC. In non-utility grid applications solar panels produce dc power for emergency roadside telephones, navigation buoys, and other remote loads. Virtually all 12-V-system solar panels comprise a series of photovoltaic cells that have a maximum output power of less than 25 W.
In producing this power the solar-panel system uses a battery to provide power when the panel is “dark.” The rechargeable battery can supply power for long periods of time, requiring a charger that can properly operate a solar panel. 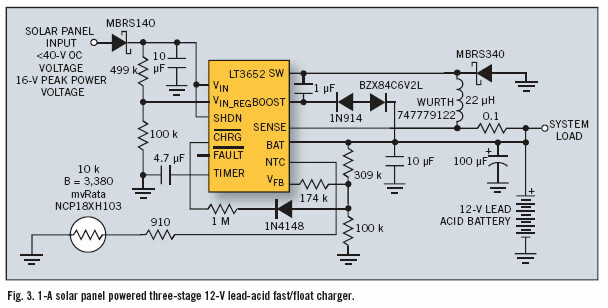 Meeting this need is Linear Technology’s LT3652 monolithic buck-charger IC, which operates with a single solar panel.